Frederick Charles Wilkinson (who may have been known as Charles) was born in Corby Glen in 1899. In 1901 he was living with his mother, Florence and her parents in Corby Glen. In 1911 Florence was in Great Gonerby as housekeeper for John Clarke, a maltster from Corby. In May 1918 Frederick Charles was working as a farm labourer in Marston when he joined 7th Battalion Sherwood Foresters (Notts and Derby Regiment). However, on 13th Aug he was admitted to the Voluntary Aid Detachment Hospital in Louth. 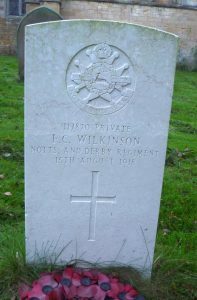 He died of a haemorrhage 2 days later at 4th General Service Hospital in Lincoln and was buried at Marston. His next of kin were John Clark Wilkinson, 7 Bourne Cottages, Inner St, Grantham and Florence Elizabeth Wilson of 6 Bourne Cottages.